The new V8 Toyota LandCruiser rear differential is 4 inches narrower than the front differential. Fitting a Wide-Track Kit to the rear of your Cruiser will increase the rear wheel track and improve on road stability and off road footprint. Each spacer is CNC machined from billet steel, zinc plated to prevent corrosion and fitted with 5 metric studs and nuts compatible with genuine Toyota steel or alloy rims. WARNING - Don't be fooled by cheap alloy spacers in the market place. Alloy spacers are not suitable for heavy vehicles when manufactured from cheap alloys. 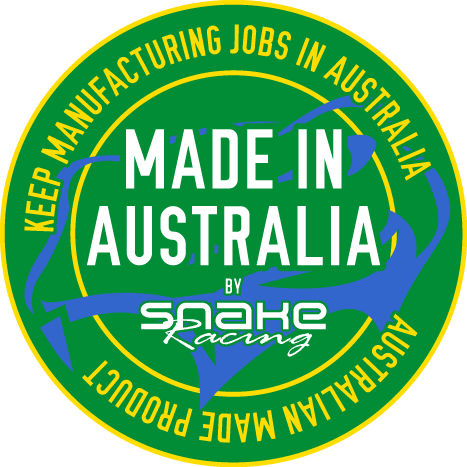 All Snake Racing V8 wide track kits are manufactured from "STEEL" the tensile strength is far stronger and better suited for the dry weight and those that run heavier trucks. Note: LandCruiser WorkMate (steel wheel) and GXL (alloy wheel) models are fitted with different length wheel studs. If you are using steel rims please select WorkMate when ordering. The 1.5 inch Wide-Track Kit is made from steel and comes complete with 2 x spacers and all fitting hardware for the rear of one V8 LandCruiser. Always use a torque wrench when tightening wheel nuts, never use a rattle gun for installation of wheels or spacers.